A GREAT WAY TO CELEBRATE A NEW PLACE! This house container is filled with lots of goodies to enjoy during the move and after. Wrapped in crisp clear cellophane and topped off with a big beautiful handmade bow. Includes a handwritten greeting card. LARGE: Wood Cutting Board, Wine and Cheese Biscuits, Cheese, Ghirardelli or Sorrento Gourmet Cocoa, "Welcome Home" Raspberry filled Shortbread Cookies, Monet Water Crackers, Sorrento Chocolate Mocha (Caramel or Double Chocolate), Nuts, Popcorn (Pecan Almond Crunch, Cranberry Walnut Crunch, Dark Chocolate with Sea Salt Crunch), Pretzel Twists (Salted Caramel), Naturally Smoked Sliced Summer Beef Sausage, and foil wrapped Tea Packets. 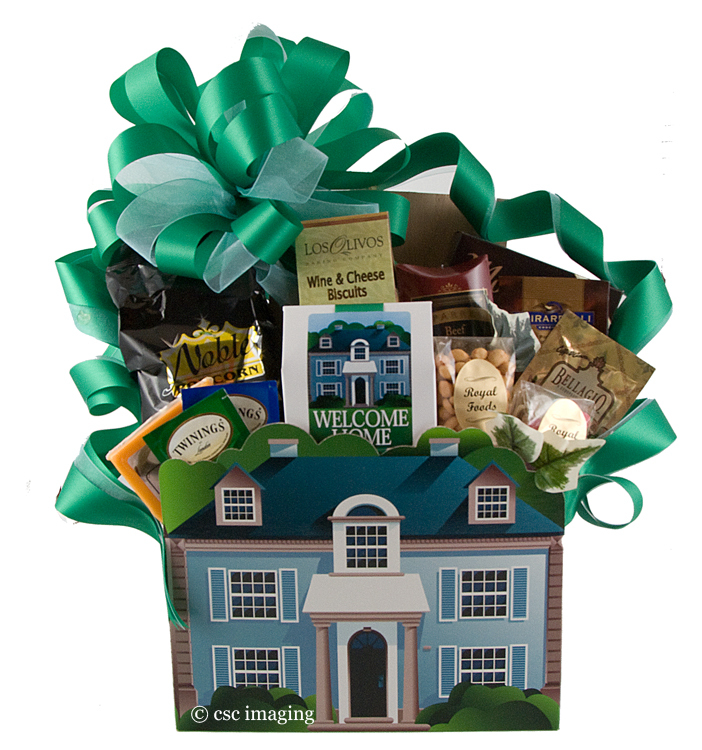 SMALL: Foil wrapped Tea Packets, Spice Drops Candies, "Welcome Home" Snack Mix, Jelly Belly Jelly Beans, Nuts, Cheese Straws, Ghirardelli or Sorrento Cocoa, Sorrento Mocha, Cookies, and flavored Popcorn.